They are great for all abilities, from those just starting out to families of all ages, for the novice as well as the elite runner. Many Joggers regularly take part and volunteer with local events being hosted in Cambridge, Bury St Edmunds, Clare Castle, Haverhill, Brandon, Thetford and Wimpole Park. Once registered you can enjoy them anywhere around the country, in fact around the world! You are welcome to walk, jog or run these events according to your preference and level of fitness. Another free weekly timed 5km that has now appeared on the local scene is Great Run Local (GRL), which starts at the bottom of Newmarket Heath’s Warren Hill on a Sunday at 11:15am., see: www.greatrunlocal.org/ There is also the option of a shorter 2.5km run for children and adults. Trying out a new format now that the numbers of Joggers doing parkruns has exceeded critical mass. First a summary of the results, followed later by comments highlighting the main achievements when I get the chance! Sorry that not everybody will get a mention. PB = all-time parkrun personal best, cPB = course PB, YB = best parkrun time so far this year. Brandon: Clive Purbrook (23:45 PB! ), Adrian Whittle (23:57), Adam Maltpress (24:17), Belinda Schofield (28:02 PB!). Bury St Edmunds: Alex Swarbrick (19:42 cPB! YB! ), Neville Clarke (20:44 =YB! ), Paul Dockerill (26:07) ran with daughter Chloe (26:05), Ruth Eberhardt (27:15). Cambridge: Iain Perry (26:14 YB! ), Malcolm Osbourn (26:27 YB! ), Jill O’Grady (26:32 PB! ), Carol Mcintosh (32:41 PB! ), Jenny Osbourn (34:21). Clare Castle: James Tweed (22:03). Coldham’s Common: James Thomson (19:42 cPB! ), Brian Munns (23:53 =YB! ), Melanie Tindale (24:01 YB! ), Stephanie Greenwood (26:57 PB! ), Jim Withers (27:35), Kate Warboys (32:44 YB! ), Alexia Smithson (33:18). Littleport: Chris Aylmer (27:13). Thetford: Elke Hausler (21:02 PB! ), Giles Macrow (24:58). Buckingham: Rob Jaina (25:06 YB!). Colchester Castle: Henry Hamilton (22:45). Conkers: Jan Holmes (26:31), Sarah Kinston (29:54). Best in age groups by proportion: Neville Clarke 1st of 12, Jan Holmes 2nd of 23, James Tweed 1st of 11, Elke Hausler 1st of 8, Melanie Tindale 1st of 6, Malcolm Osbourn 1st of 5, Giles Macrow 6th of 29, Jill O’Grady 4th of 16, Adam Maltpress 2nd of 7, Jenny Osbourn 1st of 3, James Thomson 4th of 12. 5K (56 participants overall). Newmarket Joggers: James Thomson (20:25) 7th, Elke Hausler (22:28 PB!) 10th & 1st female finisher, Richard Jones (24:29) 15th, Anna Mayhew (26:07) 2nd female, Rebecca Fordham (26:26 PB!) 3rd female, Sianie Painter (30:13) 8th female, Alison McKenzie 9th female, Giles Macrow (38:24, helper). It was a sunny, warm morning with temperatures up to around 18°C by the off. Tony Bacon and unnamed friends came from Haverhill RC to set a strong pace, with Tony coming home 2nd overall in 18:20, 7 seconds behind one of his mates. James Thomson was chasing in 7th position and put in a good performance. Elke Hausler and Rebecca both did well to post new PBs, despite the warmest conditions so far this year. 2.5K: (33 participants overall): Junior Jogger Noah Wilkinson (11:54 PB!) 4th 0verall, did well to achieve a new PB running under his father’s name, with Archie Fordham (15:04 PB!) 12th, running well too. Tilly Maxwell (12:39) and Maddie Maxwell (16:24 PB!) were 1st and 2nd females home and in great form. Not quite sure which of the runners are Junior Joggers, so apologies for mistakes or omissions. It would be great if GRL could list club affiliation like parkrun does. Brandon: Iain Perry (27:19). Bury St Edmunds: Neville Clarke (21:29), Elke Hausler (23:00), Joe Cormack (23:58, First Timer! ), Paul Dockerill (26:28) ran with daughter Chloe (26:26), Malcolm Osbourn (27:04, YB! ), Ruth Eberhardt (27:20), Carol McIntosh (33:26, PB! ), Jenny Osbourn (33:59, cPB!). Cambridge: Brian Munns (23:53, YB! ), Jan Holmes (25:42, PB! ), Rebecca Fordham (25:59, PB! ), Jim Withers (28:01), Aaron Burns (29:29), Sarah Kinston (29:42). Coldham’s Common: James Thomson & buggy (23:23). Guildford: Richard Jones (21:45, First Timer!). Haverhill: Chris Aylmer (27:11, cPB! YB!). Ipswich: Henry Hamilton (21:48, First Timer!). Littleport: Alexia Smithson (29:27, YB!). Thetford: Giles Macrow (23:50). Best in age groups by proportion: Jan Holmes 1st of 16, Neville Clarke 1st of 11, Richard Jones 3rd of 26, Elke Hausler 2nd of 12, Rebecca Fordham 5th of 23, Giles Macrow 5th of 23, Brian Munns 5th of 21, Malcolm Osbourn 1st of 3, Alexia Smithson 4th of 12. Well done Jan Holmes and Rebecca Fordham, who both achieved all-time parkrun PBs at Cambridge, Rebecca for the second week running; whatever they’re on we could all do with some! It’s also good to see Brian Munns coming back into form after injury. Richard Jones went touring to Guildford parkrun in Surrey for the first time. This parkrun started in 2012 and now regularly attracts numbers in the 400s and 500s, with a record 614 in January this year. It takes place in the spacious Stoke Park to the north of the town centre, which is nearby the large Spectrum Leisure Complex, complete with convenient car parking for participants. There are two undulating, anticlockwise laps around the park, over a mixture of grass and tarmac paths. Back up in East Anglia, Henry Hamilton did Ipswich parkrun for the first time and afterwards ran 17 miles along footpaths and trails to Felixstowe for a fish & chips lunch on the beach..that’s living in style! Newmarket GRL Sunday April 14th 2019 at 11:15am: First Anniversary! 5K (62 Participants): Henry Hamilton (20:37) 1st overall (not named in results), Richard Jones (22:09) 3rd, Elke Hausler (22:54) 5th/1st F, Hannah Parsons (23:28) 7th/2nd F, Stephen Cousins (23:10) 8th, Joe Cormack (25:27) 14th, Rebecca Fordham (26:50 PB!) 3rd F, Malcolm Osbourn (27:03), Jill O’Grady (27:35), Sianie Painter (28:21 PB! ), Alison McKenzie (28:46 PB! ), Jan Holmes (31:10), Jon Brooker & doggy (32:43), Kate Warboys (33:34), Rebecca Hannah (34:36) and Jenny Osbourn (34:42 PB!). As well as the marvellous regular GRL crew, including Angie Underdown, David Merchant, James Plowman, Debbie Read, Susan Scargill, Janet Jenkins, Anna Mayhew, Paul Foreshaw and others, volunteer helpers from Newmarket Joggers likely included Giles Macrow, Carol McIntosh and Helen Wass but apologies for any unnamed volunteers. Henry Hamilton, first finisher in the 1st Anniversary GRL. Thanks to the photographer Giles Macrow and Henry for the fantastic action photo! Brandon: Jim Withers (28:27). Bury St Edmunds: James Thomson (20:29), Bobby Jackson (20:43, First Timer! ), Neville Clarke (21:29). Thanks to volunteer Ruth Eberhardt. Cambridge: Rebecca Fordham (26:11, PB! ), Sarah Kinston (29:36), Aaron Burns (30:12), Alexia Smithson (30:15, cPB!). Thanks to Richard Jones (23:01), volunteer pacer for 23 min. Castle Park: Iain Perry (25:07 PB!). Coldham’s Common: Thanks to volunteer Melanie Tindale. Crystal Palace: Henry Hamilton (21:38, First Timer!). Ipswich: Adrian Whittle (24:03, First Timer!). Littleport: Dave Price (27:51, YB! First Timer!). Thetford: Thanks to Giles Macrow (29:16), volunteer pacer for 29 min. Wepre: James Tweed (23:48, First Timer!). Wimpole Estate: Chris Aylmer (29:58). Best in age groups by proportion: Neville Clarke 1st of 11, Rebecca Fordham 3rd of 23, James Thomson 2nd of 12, Henry Hamilton 5th of 24, Richard Jones 6th of 22, Bobby Jackson 3rd of 10, James Tweed 4th of 14, Adrian Whittle 7th of 25, Chris Aylmer 2nd of 6. Congratulations to star of the week Rebecca Fordham, who achieved an all-time parkrun PB at Cambridge, following her best ever 5K Handicap time (26:35) last Tuesday. Also to Iain Perry for gaining an all-time PB in his first attempt at Castle Park parkrun in Bishop’s Stortford, after 80 parkruns spanning 5 years. Alexia Smithson did well to gain a course PB at Cambridge and Dave Price recorded his best parkrun time this year at Littleport. Neville Clarke continues in invincible form in his age group. James Tweed was a tourist at Wepre parkrun in Wales, Wepre being Welsh for “hilly” and it certainly lived up to its name with 437ft of climb. Iain Perry was touring Bishop’s Stortford parkrun, confusingly called Castle Park. This was the complete opposite of James Tweed’s experience; a flat and fast course over hard paths….perhaps a good target venue for Joggers searching for an all-time PB, as Iain can testify. Henry Hamilton notched up another tourist venue with his first visit to Crystal Palace parkrun. This is about as attractive and interesting a parkrun route as anyone could wish for. It twists and turns through the park, circles two lakes and a maze and tours the terraces that used to lead up to the grand Crystal Palace building. 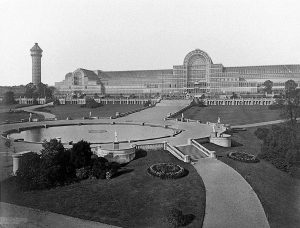 Alas, the astonishing Crystal Palace glasshouse built for the Great Exhibition of 1851 in Hyde Park has long ceased to exist. After the exhibition, it was moved, lock, stock and barrel to be reassembled on Sydenham Hill in Penge, itself an enormous undertaking in 1854 (see photo). The Crystal Palace at Sydenham (1854). Credit to Philip Henry Delamotte (1821–1889) – Smithsonian Libraries. The immediate residential area soon became known as Crystal Palace and the building became the glittering showpiece of an extravagant Victorian pleasure garden called Crystal Palace Park, which eventually staged the FA Cup Final from 1895 to 1914. Crystal Palace Football Club was founded in 1905 and played on this site. During the depression after World War I, the Palace and gardens went into decline and the owners were declared bankrupt. There were national and charitable attempts to revive and restore the building but its final fate was sealed in 1936, when it sadly caught fire after a small gas explosion in one of the rooms and burned to the ground in hours. However, the name, the area and the park live on and are now thriving in the early 21st century. Crystal Palace even beat Newcastle away this weekend to stay clear from the relegation zone in the Premier League. Just one Jogger in the GRL 5K this week. Giles Macrow, after kindly setting up the course earlier, treated himself to a proper run for a change, coming home in 24:27, 9th of 33 participants; not quite a PB but a very good effort. In the GRL 2.5K, Junior Jogger Cerys Bithell was in good form, coming home 2nd of 6 overall and first female of 3 in 12:27, which works out at slightly under 5 min/km or 8 min/mile, so pretty fast going. Brandon: Thanks to volunteers Adam & Rachael Maltpress. Cambridge: James Tweed (21:02, YB! ), Stephen Cousins (22:38, YB! ), Jan Holmes (26:08, PB! ), Rebecca Fordham (26:25, PB! ), Jim Withers (27:12), Chris Aylmer (27:37, YB! ), Stephanie Greenwood (27:49, PB! ), Sarah Kinston (30:26). Bury St Edmunds: Jason Bevan (21:01), Ruth Eberhardt (23:39, YB! ), Alan Thornhill (30:38), Thanks to volunteer Giles Macrow. Coldham’s Common: James Thomson (22:22, buggy PB! ), Alexia Smithson (29:41, cPB! YB! ), Jenny Osbourn (33:43, YB! ), Carol McIntosh (33:43). Littleport: Neville Clarke (20:44, cPB! YB! ), Emma Newman (25:02). Watermeadows: Henry Hamilton (20:53). Blickling: Kate Warboys (33:34). Southampton: Adrian Whittle (25:04). Best in age groups: Emma Newman 1st of 13, Neville Clarke 1st of 2 by 16 minutes, James Tweed 2nd of 29, Jan Holmes 2nd of 23, Stephanie Greenwood 3rd of 25, Ruth Eberhardt 3rd of 16, Henry Hamilton 3rd of 11, Rebecca Fordham 4th of 23, Jason Bevan 4th of 11. Lots of PBs and best of year performances from the Joggers, with parkrun courses in perfect condition this week. Star of the week was Neville Clarke (20:44) at Littleport, who achieved his best parkrun time since April 2017 and moved up from Diamond to Sapphire club standard with 80.15% age grade. Also at Littleport, Emma Newman (25:02) unfortunately exacerbated her leg injury and had to stop and walk at one point, before finding it was less painful to carry on running. Despite this, she still managed to come 1st of 13 in her age group. We hope this annoying injury heals up as soon as possible. Definitely also worth a mention is James Thomson (22:22), who set a new all-time buggy parkrun PB at Coldham’s Common, with daughter Norah aboard. That’s a very good time without buggy or baby to push round! Three tourists this week. Kate Warboys (33:34), has run at Blickling parkrun in Norfolk quite a few times, no doubt with family connections there. The route is part of the Mausoleum Walk, as it encounters a mausoleum hidden in woods along the way (as does Brandon parkrun). It’s a very scenic 2 lap course over undulating, wooded parkland and commands a lovely view over a lake and towards the Bure Valley at one point. Moving to Northamptonshire, Henry Hamilton (20:53) had his first go at Watermeadows parkrun in Towcester. This is a 3-lap course around a large area of attractive open parkland, surrounded by trees and bordered by the River Tove for half of the perimeter. This new parkrun began in February this year and is currently attracting 100 to 150 participants per week. The other tourist was Adrian Whittle (25:04), who joined 1,005 others in the huge Southampton parkrun, which he has done a good many times. The parkrun began in 2012 and rivals Bushy Park for sheer numbers, with 1,295 standing as the record attendance in January this year. The course itself is flat and fast over tarmac paths on Southampton Common, so ideal in most types of weather, summer and winter. No doubt they have plenty of salt to melt any ice in the winter. 5K: Elke Hausler (24:25) 1st female and 2nd of 50 overall, Cerys Bithell (28:54, PB!) 3rd female, Ellie Bithell (28:57) 4th female, Sianie Painter (37:12) 7th female, Jason Singh (39:39, PB!). 2.5K: No Joggers participated. Chris Aylmer 1, David Merchant 11, Debbie Read 7, Giles Macrow 9, Helen Wass 11, Ian Buchen 1, James Plowman 10, Janet Jenkins 6, Joe Cormack 1, Jon Barrett 1, Katie Margason 1, Paul Forshaw 8, Richard Jones 1, Susan Scargill 11. Thanks to all. Cambridge: Mike Sales (25:36), Aaron Burns (28:32), Alexia Smithson (30:58). Bury St Edmunds: Ruth Eberhardt (28:53). Brandon: Neville Clarke (21:38, YB! ), Clive Purbrook (23:49, cPB! YB! ), Brian Munns (24:59, YB! ), Adam Maltpress (25:39), Iain Perry (26:21, YB! ), Jon Brooker (26:27), Belinda Schofield (28:05, cPB! YB! ), Stephanie Greenwood (28:16), Jim Withers (28:17), Chris Aylmer (29:52), Kate Warboys (35:40), Emma Reader (39:42, cPB! YB!). Thetford: Giles Macrow (23:49, YB!). Penrose: Melanie Tindale (25:18), Ellenbrook Fields: Richard Jones (21:08), Bicester: Henry Hamilton (19:35, cPB! YB!). Littleport: Emma Newman (22:15), Isabel Vicente & pooch (56:06). Coldham’s Common: James Thomson & Norah in buggy (23:19). Best age group performances: Henry Hamilton 1st of 17, Emma Newman 1st of 8 & 1st female finisher of 107!, Neville Clarke 1st of 3 by over 8 minutes!, Richard Jones 2nd of 14, Melanie Tindale 2nd of 13, Stephanie Greenwood 2nd of 8. Well done all who participated. Newmarket GRL on Sunday 24th Mar 2019 at 11:15am. 5K: Hannah Parsons (23:23, PB! ), 4th of 50, 1st female finisher!, Giles Macrow (37:41, tail walker). 2.5K: Cerys Bithell (12:24), 2nd of 42, 1st female finisher!, Ellie Bithell (12:43, PB! ), Connor Bithell (14:47), Lauren Bithell (15:14, PB! ), Colin Bithell (15:18, PB!). SUMMARY: Brandon: Clive Purbrook (24:35), Malcolm Osbourn (27:55), Rebecca Fordham (28:40, PB! ), Belinda Schofield (28:56, cPB! ), Jan Holmes (29:23), Jenny Osbourn (36:08). Best age group performances: Rebecca Fordham 1st of 7, Jan Holmes 1st of 5, Clive Purbrook, 1st of 3. Bury St Edmunds: Paul Dockerill (25:00), Ruth Eberhardt (26:53), Stephanie Greenwood (29:34). Best in age group, Ruth Eberhardt 3rd of 20. Cambridge: Richard Jones (21:49), Alexia Smithson (31:49), Iain Perry (33:05). Best in age group, Richard Jones 2nd of 16. Coldham’s Common: Chris Aylmer (29:06). Thetford: Giles Macrow (24:18, YB! ), 5th of 19 in age group. Beeston: Emma Newman (22:25), 3rd female of 116 and 1st of 11 by age group. Loch Neaton: Alan Thornhill (31:55), 1st of 2 in age group. A couple of tourists to note this week. Emma tried out Beeston parkrun near Nottingham for the first time, while Alan tackled Loch Neaton on the outskirts of Watton, Norfolk, a new parkrun only in its 3rd week. Beeston is a lovely fast, flat, winding course, running alongside the Nottingham to Beeston Canal and beside the River Trent, with a cafe just 100m from the finish, just how it should be. Loch Neaton has an interesting history (see link below). In 1875 they needed to excavate two huge holes in the ground, to obtain earth to form a mile long embankment for the extension of the railway line from Watton to Swaffham. This was a massive undertaking and the back-breaking work was done mainly by Scottish labourers, after whom the hole nearest Watton was called a Loch when it was subsequently filled with water, by means of a wind-powered pump from a spring water source. The whole area was cleverly turned into a very fashionable late Victorian and Edwardian landscaped leisure park with tennis courts, bowling green, fishing, boating, swimming, diving, concerts, sporting events etc. The sporting events, believe it or not, included a Whit Monday Marathon in the early 1900s, possibly spawned by the dramatically famous London 1908 Olympic Marathon, when Italian Dorando Pietri collapsed yards from the finish line and was then disqualified when helped to cross the line (similar to Pheidippides, the original legendary Greek marathon runner, who died from exhaustion after he reached Athens from Marathon to announce Greek victory against the Persians). Sadly the railway line was closed by Dr Beeching in 1964 after all that incredibly hard work and effort 89 years earlier. However Loch Neaton lives on, returned more or less to nature (and parkruns now instead of marathons!) from its heyday as a fashionable tourist destination. Resurrecting the Whit Monday Marathon might be an interesting idea, but it would need to be on Spring Bank Holiday, the last Monday in May, as Whit Monday has not been a public holiday since 1967. Newmarket GRL on Sunday 17th Mar 2019 at 11:15am. There was a good turnout of 34 in the 5K on Sunday, including 8 Newmarket Joggers who finished as follows: 2nd Neville Clarke (22:17, First Timer! ), 3rd Richard Jones (22:40), 5th/1st F (female) Elke Hausler (23:54), 6th/2nd F Ellie Bithell (24:44, PB! ), 14th/4th F Bee Chapman (27:29), 17th/5th F Rebecca Fordham (27:52, PB! ), 19th Malcolm Osbourn (28:15), 23rd/7th F Sianie Painter (31:18). A triumph for the more mature runners this week, with MV65 Neville leading the Joggers home in his first attempt at this route and MV55 Richard following on closely behind, plus an equally good performance from FV55 Elke, first female finisher. Well done to the PB Joggers Ellie and Rebecca too and to all who participated. Ellie’s son and daughter, Junior Joggers Connor (15:34) and Lauren (16:20) both ran well in the 2.5K, accompanied by their father Colin. SUMMARY: Reading: Niamh McGroarty (51:46). Cambridge: Eadie Brooker (23:36). South Norwood: Henry Hamilton (22:57). Bury St Edmunds: Clive Purbrook (24:46), Brian Munns (26:05, YB! ), Ruth Eberhardt (27:28), Paul Dockerill (27:29), Belinda Schofield (28:48). Brandon Country Park: Adam Maltpress (27:59), Stephanie Greenwood (28:14, PB! ), Charlie Davis (31:45), Alexia Smithson (36:04), Emma Reader (40:11). Coldham’s Common: James Thomson & Buggy (24:22), Melanie Tindale (25:14). Clare Castle: Iain Perry (26:31, YB!). Thetford: Chris Aylmer (29:34). Reading: It was the first parkrun since 2017 for Niamh, who was likely taking an easier run/walk with family and friends. Her all-time parkrun PB of 28:19 was achieved at Cambridge in 2015. Cambridge: Junior Jogger Eadie put in another top run, finishing 1st of 7 in her JW11-14 age group and just 6 seconds outside her all-time PB achieved in February. South Norwood: Henry was touring at South Norwood parkrun, south of London near Croydon. He was possibly staying over for his Surrey Half Marathon race the next day at Woking, so put in a slightly more relaxed run than normal. This parkrun is a 2 lap course in South Norwood Park over well-kept trail paths and began in 2017. Henry’s visit coincided with a record parkrun attendance of 300 and a lot of course age-group records, with no previous attendance even in the 200s. This was due to a locally publicised “Big Mob Match” between Croydon Harriers and Striders of Croydon AC, the two local rival running clubs. Bury St Edmunds: Clive led the Joggers home at Bury St Edmunds, just pipping former Jogger Adrian Whittle (24:50) by 4 seconds and finishing 2nd of 15 by age group. Brian had his best parkrun time this year and is slowly recovering from hamstring injury. Ruth was well up there, 4th of 13 in her age group. Paul was running with his daughter Chloe (27:37), who put in a good performance in the colours of St Edmund Pacers, just beaten by 1 second in her age group. Belinda was bang on form again, 1st of 6 in her age group. Brandon: Congratulations to Stephanie, who was star of the day with an all-time parkrun PB of 28:14 after 27 parkruns! It was nice to note that Emma was running her first parkrun since 2017 and also that Greg Davis’s daughter Charlie was participating in her first ever parkrun. Coldham’s Common: James put in another good buggy time while Melanie was 1st of 8 in her age group and also kindly volunteered as a helper. Clare Castle: Iain is improving all the time and achieved his best parkrun time of the year; in fact his best time since 2017. 5K: Sparkling PBs for Stuart Sowerby (21:15, PB! ), 2nd of 30 participants overall, and for Ellie Bithell (25:08, PB! ), 1st female runner home. Well done both of them. 2.5K: Stuart’s son Oscar (16:08) and daughter Milly (18:33), plus Ellie’s two daughters Lauren (19:31) and Cerys (20:45) all put in good runs in the 2.5K event. It looks like Cerys was generously keeping a watchful eye on young Lauren, while mum was running her PB in the 5K. NJ parkrun Results for Saturday 2nd Mar. Wimpole Estate: A large contingent of Joggers, friends and family descended on Wimpole parkrun to celebrate the 250th parkrun of James Thomson, including runners and supporters. Richard Jones, Jan Holmes and Sarah Kinston were kindly helping out as volunteers. It was fitting that James should be first of 16 Joggers home with a course PB of 20:35. He finished 3rd of 21 in his age group and 13th of 396 participants overall. This route is a difficult one over rough, uneven, grassy paths, with a looming, daunting hill in the middle. It’s also a joy to run here on a fine day. According to GPS, the distance has always been as close as you can get to the full Monty 5K (3.1m), as it should be, no mercy spared. After the parkrun, the Joggers gathered in a specially reserved room of the Wimpole Hall cafe to enjoy bacon and egg rolls, tea, coffee and homemade cakes, all kindly laid on by James and his family. Those completing the parkrun were as follows: James Thomson (20:35, cPB! ), Jon Brooker (20:50), Henry Hamilton (22:12), Emma Newman (23:01, cPB! ), Clive Purbrook (25:08), Giles Macrow (27:27), Brian Munns (27:40, YB! ), Ruth Eberhardt (27:42), Jill O’Grady (27:47, YB! ), Belinda Schofield (29:03), Chris Aylmer (29:19), Alan Thornhill (33:04), Rebecca Fordham (34:43), Caroline McIntosh (35:05, cPB! ), Jenny Osbourn (35:53, cPB!). Best age group performances were: Jon Brooker, 1st of 40 with age grade 73.1%; Ruth Eberhardt, 1st of 17; Belinda Schofield, 1st of 7; Jenny Osbourn, 1st of 3; Emma Newman, 2nd of 15; Clive Purbrook, 2nd of 11; Chris Aylmer 2nd of 7; Alan Thornhill, 2nd of 4; James Thomson 3rd of 21; Jill O’Grady, 4th of 12. A good number of Joggers were taking easier runs before the Cambridge HM the next day. Well done to all who ran, helped and supported. Other parkrun results: Bury St Edmunds: Paul Dockerill (19:36, PB! ), Rebecca Hannah (33:24). It was a 16 second all-time parkrun PB for Paul, who finished 1st of 12 in his age group and 4th of 296 overall, a tremendous run. Rebecca was glad to get back in the groove, despite being jet-lagged after her return from a holiday in New Zealand. Clare Castle: James Tweed (21:49, YB! ), Iain Perry (33:48). James did well to come 2nd of 11 and 9th of 147 runners overall, while Iain was helping as a pacer for family and friends and saving his best effort for the Cambridge HM the next day. 5K: Hannah Parsons (25:08, PB!) put in a great effort to finish first female home and 4th overall from a field of 25, gaining another PB in her 4th run to date. Not far behind Hannah, and 2nd female to finish, was Jill O’Grady (27:47) in her 3rd GRL. 2.5K: Junior Jogger Cerys Bithell (12:30) showed them all the way home in the 2.5K event, coming in 1st of 13 participants overall in her 10th GRL. Her sister Lauren Bithell (18:28) was 2nd female home followed by brother Connor Bithell (19:22). Well done to all of them! Brandon Country Park: There was a big gathering of Joggers at Brandon parkrun for the social outing organised by Jeremy and Emma Reader, which included a waffle breakfast at a nearby restaurant after the parkrun. Joggers were either running, acting as volunteer helpers or giving support to club members while relaxing in Brandon Country Park. Sarah Kinston, Caroline McIntosh and James Thomson generously acted as volunteer helpers. Those participating in the run were in order of finishing: Henry Hamilton (20:49), Adam Maltpress (22:09, PB! ), Clive Purbrook (24:32), Giles Macrow (25:58), Baz Colley (26:34, cPB! ), Jim Withers (27:00), Paul Dockerill (27:23, running with daughter Chloe 27:22), Jan Holmes (28:15, cPB! ), Malcolm Osbourn (28:21), Rebecca Fordham (29:03), Belinda Schofield (29:10), Kate Warboys (34:27), Brian Munns (34:27), Jenny Osbourn (35:30). Best performances by age group were: Henry Hamilton 1st of 7, Adam Maltpress 1st of 6, Clive Purbrook 1st of 4, Belinda Schofield 1st of 3, Jan Holmes 1st of 2 (by over 16 minutes! ), Chloe Dockerill 1st of 2. It was an all-time parkrun PB for Adam and course PBs for Baz and Jan. Well done to all who helped, supported and participated. York: Emma Newman (22:18), 1st of 23 in age group. Cambridge: Richard Jones (21:20), 2nd of 23. Bury St Edmunds: Ruth Eberhardt (28:52), Stephanie Greenwood (29:30, YB+cPB! ), Alan Thornhill (32:39). Thetford: Bobby Jackson (21:43), 2nd of 6. Holkham: Eadie Brooker (24:15) 1st of 4, Tianna Brooker (28:31), 2nd of 4, Jon Brooker (28:32). Coldham’s Common: Melanie Tindale (24:31), 2nd of 6. Melanie also kindly helped as a volunteer. James Tweed (22:15) was 4th home of 32 participants overall in his 9th GRL and scored a PB by a few seconds, so very well done. In the 2.5K event, Junior Jogger Cerys Bithell did very well to complete this difficult course in 12:15, finishing first female and 2nd of 33 participants overall in her 9th run. Bushy: Henry Hamilton 20:39YB. Cambridge: Emma Newman 23:00, Eadie Brooker (Jnr) 23:30PB, Jon Brooker 23:30, Iain Perry 26:32 YB, Jan Holmes 27:23YB, Jill O’Grady 28:32, Rebecca Fordham 28:44PB, Sianie Painter 30:32, Sarah Kinston 31:31, Alexia Smithson 31:32. Bury St Edmunds: James Tweed 21:51cPB, Neville Clarke 22:16, Clive Purbrook 24:31PB, Ruth Eberhardt 26:00, Paul Dockerill 27:44 (ran with daughter Chloe), Belinda Schofield 28:05PB. Eden Project: Jason Bevan 31:02 (easier run). Brandon: Stephanie Greenwood 29:59. Thetford: Giles Macrow 24:32. Clare Castle: Alan Thornhill 33:02. Blickling: Kate Warboys 33:32. Rutland Water: Melanie Tindale: 24:29YB Coldham’s Common: Mark Hayward 18:56YB, James Thomson (+buggy) 22:43PB. Brooklands: Richard Jones 21:33. Best age group performances: James Tweed 1/34, Neville Clarke 1/11, Belinda Schofield 1/8, Eadie Brooker 1/4, Richard Jones 2/12, Emma Newman 3/34, Rebecca Fordham 3/21, Ruth Eberhardt 3/19, Jan Holmes 3/17, Clive Purbrook 3/16, Stephanie Greenwood 3/8, Melanie Tindale 4/20, Mark Hayward 4/14. Well done to all who ran. Special congratulations to Junior Jogger Eadie Brooker (11), who gained a big PB of 23:30 at Cambridge parkrun, earning herself Platinum club standard. Top mention also of James Thomson’s buggy PB at Coldham’s Common, still managing to finish 7th of 16 in his age group while giving his daughter a joy ride! Richard Jones played tourist at Brooklands parkrun, near Weybridge in Surrey. This parkrun only began life in November last year but is already attracting fields in the 200s to 300s. It follows a beautiful route in Brooklands Community Park, over hard paths, trails, through woods and alongside the River Wey. It’s right beside the Brooklands Aviation and Motor Museum, which is most famous for being the site of the first purpose-built motor racing track in the world, constructed in 1907, as well as the UK’s first aerodrome. The racing circuit is preserved and encircles the Community Park and Museum, with the parkrun route crossing over it twice in each lap. Some of the original buildings are now listed and restored to form part of the museum. Jason Bevan visited Eden Project parkrun near St Austell in Cornwall, which began in Nov 2017, 21 years after the original Eden environmental conservation project was conceived, eventually opening its doors to the public in 2001. The parkrun zig-zags inside the former clay pit crater, passing right by the huge Mediterranean and Amazon Biome bubbles, which contain exotic plants and trees. The route finishes inside the crater but starts at the top of it, so finishes quite a lot lower than it starts; nevertheless there are still several stiff uphill sections involved, so no easy parkrun. 5K: Giles Macrow 36:40 (recovery after long run) 2.5K: Cerys Bithell 12:51 (2nd of 20 overall and 1st of 5 female runners). Bury St Edmunds: Henry Hamilton 22:00, Neville Clarke 22:44, Clive Purbrook 24:56, Paul Dockerill 26:50, Ruth Eberhardt 28:21, Belinda Schofield 29:26, Stephanie Greenwood 31:30. Huntingdon: Sam Sadler 19:10, Jan Holmes 28:28. Brandon: Iain Perry 26:58YB, Adam Maltpress 27:27. Thetford: Giles Macrow 25:13. Clare Castle: James Tweed 22:27. Haverhill: Chris Aylmer 31:17. Littleport: James Thomson 20:17, Mark Hayward 21:44 (missed a turning), Emma Newman 23:16. Newmarket GRL 10th Feb 2019: cancelled due to equine flu. Both Cambridge parkruns were cancelled due to the icy conditions of the courses, so the number of Joggers parkrunning was a bit down this week. Henry Hamilton continued in his quest for interesting parkrun experiences. This week he was at Fire Service College parkrun in Moreton-in-Marsh, Gloucestershire. This is a flat, 3-lap course over playing fields, woodland and tarmac path. The parkrun only began on the 8th December last year but attendance is already in the 200 to 300 range with a record of 332 in early January. Henry clocked a very decent 22:29 and came 1st of 5 in his age group. Also touring was Melanie Tindale (25:27) at Rutland Water parkrun, which she has run on 13 occasions with a course PB of 21:45 last year. It was her best parkrun so far this year and she finished 5th of 18 in her age category. James Tweed (22:16) was at his local Clare Castle parkrun and finished 6th of 95 overall and 3rd of 11 in his age group, so a good outing for him. Thetford was more popular this week with 3 Joggers attending: Bobby Jackson (20:25), James Thomson (22:57) and Giles Macrow (32:10). Giles was kindly helping as 32 minute pacemaker and James was pushing the buggy with his daughter inside. It was a Buggy PB for James by 7 seconds, beating his previous best of 23:04 at Haverhill. Amazingly, he was also 2nd of 6 in his age group against all the others who had no buggy to push. That’s certainly an excellent way to train and keep fit when you have a small child to care for. Bobby put in a top effort in his first parkrun this year and was 6th of 243 overall and 1st of 4 in his age group by over 4 minutes, just 1 second outside his course PB. Iain Perry was on the ball and noticed both Cambridge parkruns were cancelled, so was able to get to Brandon instead, unlike a few Joggers such as….well….me for one! Not that he’s a stranger to Brandon and has done it a good many times. He clocked 28:14, which is his best time of 2019 and his renaissance continues. At Bury St Edmunds, Belinda Schofield (28:28) returned for her third parkrun and promptly achieved another PB by 3 seconds, 2nd of 7 in her age group. Interestingly, the first in this FV60 age group was Sonia McClintock, a very able runner, who was a club member until a year ago. Ruth Eberhardt (25:58) is staying in very consistent form, with her last 5 parkruns in the 25 minute bracket, and came home 5th of 16 by age group. Joggers participating in the 5K GRL were: Richard Wilkinson (21:45, 4th), Richard Jones (22:57, 6th), Hannah Parsons (25:36, 3rd F), Giles Macrow (26:42, 19th), Baz Colley (27:24, 26th), Jan Holmes (29:07, 10th F), Chris Aylmer (29:32, 39th), Sianie Painter (29:43, 11th F). Well done Richard and Jan, who both recorded course PBs. Giles also ran earlier in the new Walsham Le Willows GRL at 9:30am, clocking 26:52 after a late start. He was helping the starter set up the timing phone properly. In the 2.5K GRL, Junior Jogger Cerys Bithell (12:04) came 1st of 5 females and 2nd of 31 runners overall, gaining a course PB, so a very good effort. Next was mother Ellie Bithell (13:23), 2nd female home, also with a course PB. Youngest daughter Lauren Bithell did well to finish in 23:46. Numbers at the GRL are definitely climbing steadily with 55 in the 5K and 31 in the 2.5K event. Interestingly, the first home in the 5K was racewalker George Wilkinson (20:45), son of Richard and younger brother of racewalker Callum. On this occasion he ran, rather than walked, but has a PB of 24:24 in the 5K walk, so might have been about 12th walking the course. His brother Callum has an incredible PB of 19:17 in the 5K walk, so could have been first finisher in this GRL keeping one foot on the ground! Jon Brooker (20:35) was a bona fide tourist at the fairly new Swaffham parkrun, between King’s Lynn and Norwich, which launched in May last year. He did well to finish 5th of 101 overall and 1st of 9 in his age category. Numbers have averaged around 75 weekly since the launch but recently there have been several weeks making it over 100. The course is a flat 3-lapper over the playing fields of the Swaffham Junior School nearby. Not far south of here, Clodie Rolph (31:43) and Kate Warboys (33:29) put in good, steady runs at Thetford parkrun, both first-timers at this venue and running their first parkruns of 2019. In fact, Clodie hadn’t run any parkruns at all since her first one in April 2017, when she clocked 31:46 at Cambridge, so it was a welcome all-time PB for her by 3 seconds. Close by at Brandon, Adam Maltpress (28:40) and Chris Aylmer (29:55) were in action. Adam, who has a parkrun 2019 PB of 22:43, was probably taking an easier run before his 15K Dirt Run the next day in Irchester, while Chris tripped over a tree root soon after the start and was glad to make it home in just under 30 minutes. A regular runner at Thetford, Giles Macrow (26:25) decided instead to try out Coldham’s Common in Cambridge for the first time. He put in a good effort over this 2-lapper around playing fields on the Common. The course has been changed so that the start and finish are now in the same place; a much better idea. Melanie Tindale was generously helping as a volunteer at this parkrun. Cambridge parkrun at Milton was back at over 500 participants for only the second time since Coldham’s Common set up their rival parkrun venue last September. There was a sizeable bunch of Joggers running: James Thomson (20:21), Henry Hamilton (21:11), Richard Jones (21:15), Jan Holmes (27:49), Iain Perry (28:28), Sianie Painter (29:16) and Sarah Kinston (30:10). Sarah put in a good, steady effort, maybe primarily focusing on her half marathon preparation with a long run the next day. Sianie recorded her best parkrun time this year and a new PB at Cambridge, finishing 5th of 24 in her age group, so a very good run. Iain and Jan also achieved their best times of 2019. Iain is definitely on the upgrade, while Jan did well to finish 4th of 23 in her age category. Richard, Henry and James finished 2nd of 18, 4th of 22 and 3rd of 19 by age category respectively, with Henry recording a new Cambridge PB, so all top efforts. Finally, at Bury St Edmunds, Paul Dockerill (23:25), Clive Purbrook (24:47), Ruth Eberhardt (25:29), Belinda Schofield (28:31) and Stephanie Greenwood (30:43) were on the starting line in Nowton Park. Belinda and Clive both achieved parkrun PBs in their second parkrun, with Belinda 1st of 5 in her age group by over 7 minutes and Clive 5th of 14 in his, so an excellent double act. Stephanie put in her best parkrun time of 2019, as did Ruth, who finished 3rd of 16 in her age category. Paul was first Jogger home but, by his standards, appears to have been taking a slightly easier run this week, possibly helping to pace somebody. Neville Clarke was kindly acting as a marshal before his Freethorpe 10 mile race the next day. There were 5 Joggers at the Newmarket GRL, out of a total field of 34 in the 5K: Stuart Sowerby (21:18, 2nd), Richard Jones (21:41, 3rd), James Tweed (22:19, 6th), Chris Aylmer (29:53, 26th) and Giles Macrow (32:53, started late and injured calf). No PBs to note, probably due to the very windy weather which was dead against coming down the hill. There are 4 interesting tourist excursions to report on this week. Melanie Tindale (26:00) took the trip to Oxford parkrun, which was established in 2011, the year after Cambridge parkrun began. The first parkrun here attracted just 50 participants, but fields of around 400-500 are the norm now. Melanie did well to finish 3rd of 18 by age group in her first attempt at this venue. The course is in Cutteslowe and Sunnymead Park (quite a mouthful) in north Oxford, a 2 lap route along footpaths circling wooded parkland. Part of the course is shared with the Peace Mile, founded in 1987 by Sri Chinmoy, an Indian spiritual leader and advocate of world peace, who died in 2007. He invited all people to walk or run the measured mile to find their own inner peace. Meanwhile Giles Macrow (28:00) was at Brueton parkrun, adjoining Solihull and southeast of Birmingham, where there was a huge field of 749. Giles was probably taking it easy before his 5K and 10K at Snetterton the next day. He was 48th of 68 in his age group, illustrating the huge amount of competition around him. This parkrun is a little over 2 laps, all on tarmac and almost flat with minor undulations. It goes through some lovely wooded parkland owned by Warwickshire Wildlife Trust. Up at York, Emma Newman (21:40) put in another fine run, not far from her 21:14 course and all-time parkrun PB, finishing 4th of 201 women overall and 1st of 23 by age category. This course is flat and fast, going along service roads on the inside of York Racecourse. The last of the wanderers was Henry Hamilton (20:51), who was down at Clapham Common in south London. 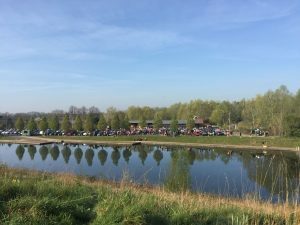 Now this was even huger than Brueton parkrun, with a total of 941 participants….and it only started in March last year! In his first run here, Henry came a very decent 9th of 44 by age group. This is a flat 2 lap course, mainly over hard paths on the Common. Cambridge was popular with the Joggers. At Milton, Richard Jones (21:25), Neville Clarke (21:45), Sarah Kinston (30:07), Sianie Painter (30:08), Alexia Smithson (30:37) and Carol McIntosh (33:30) were all in action. Carol came up trumps with a new all-time parkrun PB and was also 1st of 3 by age category, while Alexia did well to take 30 secs off her course PB. Sianie and Sarah were possibly taking it a little easier with, respectively, a XC and long run to come next day. Neville and Richard were bang on form, both heading their age groups comfortably, with Neville 1st of 11 by over a minute and Richard 1st of 20. Down at the “other place” on Coldham’s Common, James Thomson (23:39) was ploughing a lonely furrow for the Joggers, with his daughter in the buggy. He did a great job to finish 12th of 23 in his age category, despite the big handicap against him, also considering that the ground is quite bumpy and uneven in parts of the small field. Bury St Edmunds parkrun was also popular with club members. It was Clive Purbrook’s and Belinda Schofield’s first ever parkrun, so quite an occasion. Clive managed 3rd of 12 by age group, while Belinda came 1st of 6 in her age group by over 9 minutes, so a great start to their parkrun careers. Ruth Eberhardt (25:44) was solid as ever, finishing 4th of 23 in her category. Paul Dockerill (26:20) ran with daughter Chloe (26:19), who is now a junior St Edmund Pacer (cross your fingers and eat garlic to ward off the evil spirits!). She finished 1st in her age group by over 32 minutes; not bad! Stephanie Greenwood (30:55) had a steady run and was 5th of 13 by age category. Jason Bevan (32:12) was no doubt taking it easy before his impressive performance in the Stowmarket XC the next day, when he came home 3rd for the men’s team. Brandon parkrun attracted James Tweed (22:13), Neil Williamson (24:55) and Adam Maltpress (29:26). It looks like Adam sensibly put in a more relaxed run to save energy for the Snetterton 5K and 10K the next day, while Neil ran at a steady pace, without risking injury. It was James’s first attempt at Brandon and he liked the course, promising to be back again soon (“I’ll be back”). He came 2nd of 16 by age category and should improve even more now he has learnt a bit more about the course. Alan Thornhill (30:23) was on his own at Wimpole Estate parkrun and put in a good effort to earn a course PB and finish 1st in his age group by over 5 minutes. I (Chris Aylmer, 31:11) was at Haverhill and would like to say I was saving something for the XC next day, but felt unable to up the pace in the freezing, windy conditions, complete with snow flurries. Newmarket Joggers Hannah Parsons (25:13) and Jill O’Grady (27:08) both participated in the 5K and came 2nd and 9th of 13 named female runners respectively. This gave them both a well deserved course PB in their second attempts at this run. Well done. In the 2.5K run Junior Jogger Cerys Bithell clocked 24:23, which is a lot slower than her PB of 12:59 last week, so she may have been helping out as a sweeper. She was doing some secret nighttime training on this course last week so expect a PB soon! The 5K course is very accurately measured and nearly always works out exactly 5K on my watch. That’s good. However, the actual distance of the official 2K run is more than 2K and, on my watch, comes to just over 2.5K, if you don’t cut off the corner before the downhill. It could easily be changed from 2K to 2.5K and the course remeasured to the exact distance. Southwold GRL has changed its official course distances from 2K & 5K, to 1 mile & 3 miles, so it can definitely be done. The times and % age grades on the current system give false values, slower in time and lower in % age grade than they should be and there is no point in people getting a course PB over the wrong distance. Let’s change it organisers! I have a measuring wheel if you need it and we can get the course to 2.5K and change the official distance. Newsflash: There is rumour of a Stowmarket parkrun in the planning. If true, that would be good news for mid-Suffolk. No tourists to report on this week. 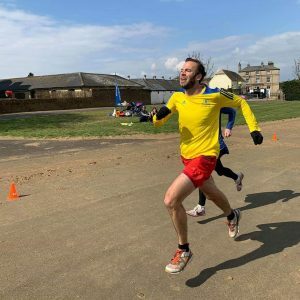 Daryl Moran (23:26) was at fairly far-flung Wimpole Estate parkrun and set himself a new course PB by over 5 minutes, having previously run once there. At Cambridge Coldham’s Common, Jamie Sales (18:21) returned to near his best form, 1st of 4 by age group and with 72.66% age grade. Mother Sarah Sales (26:15) and father Mike Sales (25:30) also had very good runs, with Sarah finishing 1st of 10 in her age group and Mike achieving a new course PB. At sister Cambridge parkrun at Milton, James Thomson (19:28), Richard Jones (21:01), Emma Newman (22:08), Eadie Brooker (24:17), Jon Brooker (24:17) and Jim Withers (27:28) were all in action. James achieved a new course PB and his best parkrun time since July 2017, also finishing 6th of 21 in his very competitive age group. Richard was solid as ever, 2nd of 21 by age group, with an age grade of 73.12%, and Emma was also in top form, 2nd of 34 in her age group. Eadie Brooker, Junior Newmarket Jogger and 11-year-old daughter of Jon Brooker, set a big new parkrun PB and finished 1st of 9 in her JW11-14 age group , so is showing great promise. Jim put in a good run, 4th of 11 by age group, though is still recovering from a nasty chest cold over the New Year. At Clare Castle there were 3 Joggers: James Tweed (22:03), Chris Aylmer (29:20) and Iain Perry (29:28). James was 1st of 8 by age group, while Iain and Chris ran close together at a very similar, steady pace. Up at Bury St Edmunds, Paul Dockerill (19:52) set himself a new course PB and was 1st of 8 by age group, so in confident form. Not to be outdone, Neville Clarke (22:21) was 1st of 10 in his age group by over 2 minutes with an age grade of 75.02%, while Ruth Eberhardt (25:46) put in her usual classy but seemingly effortless run, 4th of 22 against her age rivals. Sarah Kinston (31:30) was not overly enthusiastic about the merits of this tough course in her first visit here, no doubt slowed by the soggy and muddy terrain. The course can sometimes look dismal and behave rather abysmally underfoot in the winter months but is a picture in the spring, summer and autumn, which would be a good time to return to get a PB! Sarah ran with Rebecca Hannah (31:30) who managed 3rd of 8 by age group, so may feel a little more positive. Alexia Smithson (31:36) put in a steady effort. Finally, up at Brandon, Adam Maltpress (22:43) got quite near his PB of 22:18, while Neil Williamson (25:07) was enjoying a more relaxed run, with his PB standing at 20:43, admittedly, some years ago. Stephanie Greenwood (30:07) did well to come 3rd of 11 by age group. There was a good crowd at Warren Hill on Sunday, with a total of around 100 running in the 5K and 2.5K events. There were 7 Joggers in the 5K field. Stuart Sowerby (21:16) put in a top run to come home 2nd of 54 overall in his first run here. Hannah Parsons was 1st female to finish in 25:38 and is improving in leaps and bounds since joining the club. She was closely followed by Ellie Bithell (25:56) in second female place. Then came Jill O’Grady (27:27), also on the upgrade, in her first attempt at this course, followed by Giles Macrow (28:29, pulled a hamstring unfortunately), Chris Aylmer (29:35) and Andrew Rice (36:28). A few tourists to report on first. Alan Thornhill (30:14) took himself to Great Dunmow parkrun in Essex for his first attempt at this course. 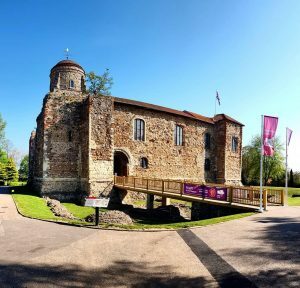 It’s between Bishop’s Stortford and Braintree and only began life in April 2018. The course is an attractive 1.5 lap route, mainly over trails which follow and criss-cross the River Chelmer for some of the way. Alan was the only one in his age group and put in a good steady run. Jason Bevan (20:19) tried out Sizewell parkrun on the Suffolk coast, where Alan (above) is the only other Jogger to have visited so far. Jason put in a good run, coming 2nd in his age group and 6th of 113 overall. He has an impressive parkrun PB of 17:35 at Cambridge back in 2014 but took 2 years off parkrun and then resumed last year, so will no doubt improve a lot if he carries on. The third tourist was Sarah Kinston (28:49) at Conkers parkrun for the 8th time, where there was a huge field of 659. Sarah ran very well to get a course PB, only 9 seconds outside her all-time parkrun PB gained at Littleport in December. She was 9th of 45 in her age group, so really moving up the ranks now! In the local parkruns, we can first look at the lone parkrunners. Adam Maltpress (23:47) was on his own at Brandon in only his 4th parkrun, having run one in 2015, one in 2017 and his third last week at Brandon. He did well to come 2nd of 5 by age group, without threatening his PB of 22:18 set last week. Giles Macrow (24:34) pushed up his pace a little at Thetford parkrun and finished 5th of 15 in his age group. Chris Aylmer (28:43) put in his 200th parkrun at Gt Cornard, where there was a lot bigger than normal turnout of 233 to say goodbye to the founding race director Lisa Dalton, who was standing down from the role after 4 years, due to illness. A lot of sponsorship money was raised for Parkinson’s UK, for whom Lisa will be running in the London Marathon this year. At Bury St Edmunds, Alex Swarbrick (20:11), Daryl Moran (23:13), Ruth Eberhardt (25:36), Malcolm Osbourn (27:08) and Jenny Osbourn (35:25) were participating. Alex is a talented Junior Jogger in the 15-17 year age band, who occasionally runs parkruns. This was his first parkrun for nearly a year and he set a new course PB, finishing 5th of 292 runners overall and 1st of 4 in his age group, so in very good form. It was Daryl’s second parkrun and his first time at this course. He did well to come 2nd of 14 in his age group and set a new parkrun PB by over 5 minutes, so showing rapid improvement. Ruth finished 4th of 28 by age group and is managing to maintain a decent speed as she builds up the training mileage for her London Marathon bid in April. Congratulations to Malcolm on his 50th parkrun! He was just pipped by 12 seconds into 2nd position of 5 in his age group and is continuing to run at a very high standard. Jenny was also close to her best time on this course with no other age rivals. The two Cambridge parkruns had a total of 798 participants between them with 499 at Milton Country Park and 299 at Coldham’s Common. At Milton, Richard Jones (21:19), James Tweed (21:24), Emma Newman (21:55), Jim Withers (27:14) and Iain Perry (29:23) were in action. It was a very high class field with 10 runners coming home in under 18 minutes, three in the 16s. Emma grabbed a course PB and continues in great form, 2nd of 22 by age group. Jim put in a decent time after being laid fairly low by a chest cold recently, as did Iain who is gradually recovering after injury and a longish lay-off. James put in an excellent effort and came 5th of 34 by age group, while Richard was also in top form and came 2nd of 16 in his age group with age grade 72.09%. Meanwhile, down at Coldham’s Common, Jon Brooker (20:25), James Thomson (23:58), Mike Sales (25:54) and Sarah Sales (26:20) were all raring to go. Jon nabbed a course PB and finished 1st of 12 in his age group with 74.04% age grade, so very much in form for 2019. James was presumably with baby daughter in buggy and did a very good time, with his all-time buggy PB remaining 23:04 at Haverhill. This buggy pushing seems to be an ideal form of strength training for legs and arms. Amazingly, James still came 12th of 17 in his age group despite this handicap. There was not a lot separating Mike and Sarah, with Mike prevailing by just 26 seconds, in a time which is in fact the same as Sarah’s all-time parkrun PB set last September. Mike himself was just 11 seconds away from his best parkrun time of 2018 which was 25:43. So Sarah appears to be closing the gap and came 2nd of 8 in her age group, though maybe Mike has a little something up his sleeve! There were 4 Joggers at the GRL on Sunday. Malcolm Osbourn put in a great run and was 8th of 46 runners overall in a PB time of 26:57, taking a precious 2 seconds off his previous best. For months, Malcolm has been patiently whittling his times down on this difficult 5K course, which has around 53 metres or 172 feet of climb. Next came Andrew Rice for the Joggers in 33:33, Giles Macrow in 34:17 and Jenny Osbourn in 35:07. It looks like Giles started his run late or was helping to pace another runner. The overall first finisher of the GRL was veteran Elke Hausler (22:53) of Eastern Veterans AC, who is in the strangely odd GRL 46-55 age group and is also in the reassuringly normal parkrun 55-59 age group, so must be 55 years old. That was a very good run by her at 78% age grade. After gaining an all-time parkrun PB of 21:14 at York on Christmas Day, Emma Newman (21:29) came back for more on New Year’s Day and put in another top run, finishing 6th of 296 female runners and 2nd of 23 in her age category. Very well done. There was one other tourist spotted at Bath Skyline parkrun on New Year’s Day: Alexia Smithson (30:57) trying out her first run there. The course is a small and large loop of Klondyke Copse on Claverton Down in Bath, mainly over gravel and grass paths. The course is mainly flat but at one point there is an upward flight of 30 woodland steps which adds to the fun. Thetford/Brandon: Neil Williamson (22:23/22:27), Malcolm Osbourn (27:12/28:53), Jan Holmes (29:07/31:49). Clare Castle/Haverhill: James Thomson (20:35/20:59), James Tweed (22:59/23:29), Giles Macrow (27:13/27:04), Ruth Eberhardt (27:23/26:56). Clare Castle/Gt Cornard: Chris Aylmer (29:09/28:49). Those opting for just one, apart from Emma and Alexia, were all at Brandon: Sara Brown (27:49), Dave Price (29:43), Carol Mcintosh (34:09) and Jenny Osbourn (35:26). In terms of age group performance, the stand out performer was James Thomson, who finished 1st of 9 in his age group at both Clare Castle and Haverhill. Other good performers were Ruth Eberhardt (4th of 20/2nd of 13), James Tweed (3rd of 15/4th of 14), Jan Holmes (3rd of 9/3rd of 11) and Sara Brown (6th of 26). Malcolm Osbourn was unlucky to have two top class performers at both venues as his only age group rivals. Bobby Jackson (22:01) played tourist for the 6th time at Moors Valley parkrun near Bournemouth in Dorset. He put in a good effort in a very competitive field, coming 53rd of 536 runners overall, without threatening his course PB, which remains at 20:14. This is a fairly level 1-lap course over gravel and tarmac paths, with the final kilometre around a picturesque lake. Back nearer HQ at Thetford parkrun, James Thomson (19:58) joined regular Giles Macrow (25:14). James was without baby buggy and let rip with a fast run, 7th of 232 overall and 1st of 10 by age category. His PB remains at 19:14. Giles put in a good steady run, with his PB standing at 22:03. Not far away at Brandon, Alexia Smithson (30:29) set a new course PB and finished 3rd of 9 in her age group. Richard Jones (22:36) was also in good form and came 20th of 163 overall and 1st of 4 in his age group by over 3 minutes. Jon Brooker (24:51) ran with his daughter Eadie Brooker (24:51) at Clare Castle parkrun. Eadie, a Junior Newmarket Jogger, was 2nd female home of 49 and 1st of 4 in her 11-14 age group, so a very good performance in only her third 5K parkrun. At Bury St Edmunds there were 3 Joggers in action: Ruth Eberhardt (25:54), Paul Dockerill (26:49) and Stephanie Greenwood (34:08). Ruth came 4th of 23 in her age group, while Stephanie enjoyed a more relaxing run. Paul was running with daughter Chloe (26:48), who was less than a minute from her best time here. Finally, at Cambridge parkrun (Milton Country Park), Neville Clarke (21:09), Stephen Cousins (23:31), Chris Aylmer (28:16) and Jim Withers (28:29) were taking part. After his total of 139 parkruns, all but two at Bury St Edmunds or Brandon, it was a surprise to see Neville at Cambridge parkrun for the very first time! He put in an excellent run, just 19 seconds from his 2018 best parkrun time, finishing 1st of 9 in his age group with 79.28% age grade. Stephen was also in good form, finishing 4th of 18 by age group. It was nice to see former Newmarket Jogger Adrian Whittle (22:33) running well and in his best form for some years. A tourist up at York, Emma Newman set herself an all-time parkrun PB of 21:14, taking 30 seconds off her previous best at Littleport parkrun. She was 9th of 263 female runners and 3rd of 43 in her age group, so a big Christmas present for her! The biggest draw for Newmarket Joggers on Christmas Day was Brandon Country Park, where 11 Joggers were in action: Jamie Sales (21:28), Mike Sales (26:54), Malcolm Osbourn (27:55), Sarah Sales (28:04), Dave Price (28:51), Chris Aylmer (29:28), Jan Holmes (29:48), Carol Mcintosh (33:56), Jenny Osbourn (35:25), Rebecca Hannah (38:54) and Sarah Kinston (42:11). Sarah ran with her father Ivor and Rebecca with her mother Andrea, both parents doing very well in their first attempts at this course. Jenny was 1st in her age group by over 3 minutes, so a top effort by her and also by Carol, who achieved a new course PB by 5 seconds. Jamie was first Jogger home and also first in his age category so in good form. The others put in decent efforts, not far from their best. Over at Bury St Edmunds, 5 Joggers took part: Paul Dockerill (19:59), James Thomson (21:08), Neville Clarke (22:14), Ruth Eberhardt (24:23) and Alan Thornhill (29:51). Alan was only 10 seconds outside a course PB and Ruth did well to come 3rd of 16 in her age group. Neville and James were zoned-in as usual, with Neville top of 5 in his age group with age grade 75.41%, while James was 2nd of 11 in his. Paul was just 4 seconds from a course PB, 17th of 309 overall and 3rd of 14 by age group, so very good running by all the Joggers at Nowton Park. Nearby at Thetford, Richard Jones (20:45) was in ace form, 11th of 194 runners overall and 2nd of 13 by age group, with age grade of 74.06%. Giles Macrow (25:06) enjoyed a good steady run at his favourite course, without threatening his PB. Christmas Day: Brandon 10:00am, Bury St Edmunds 9am, Colchester Castle 9am, Gt Cornard 9:30am, Gt Notley 9am, Huntingdon 9am, Ipswich 9am, Kesgrave 9am, Thetford 9am. New Year’s Day: Brandon 10:30am, Clare Castle 9am, Colchester Castle 9am, Felixstowe 10:30am, Gt Cornard 10:30am, Gt Notley 9am, Haverhill 10:30am, Huntingdon 9am, Ipswich 8:30am, Kesgrave 9am, Littleport 9am, Thetford 9am. Best New Year’s Day Doubles: Thetford 9am/Brandon 10:30am, Clare Castle 9am with either Haverhill 10:30am or Gt Cornard 10:30am, Ipswich 8:30am /Felixstowe 10:30am.